Bougival situates the viewer high on one of the hills bordering the Seine River, allowing for a view across the bending river to the opposite hillside, buildings, and distant scenery. 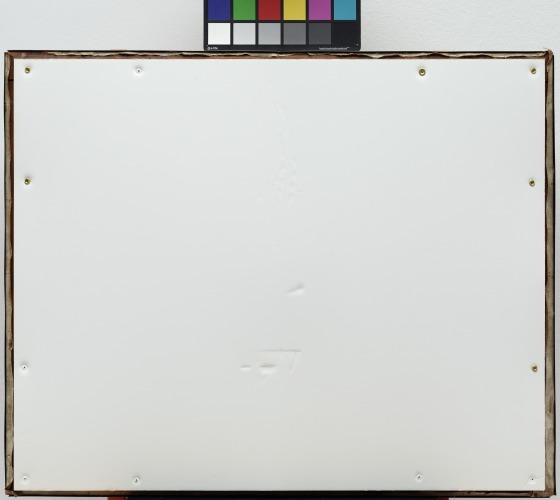 In keeping with landscape painting traditions, the work is organized into three zones: foreground, middle ground, and background. 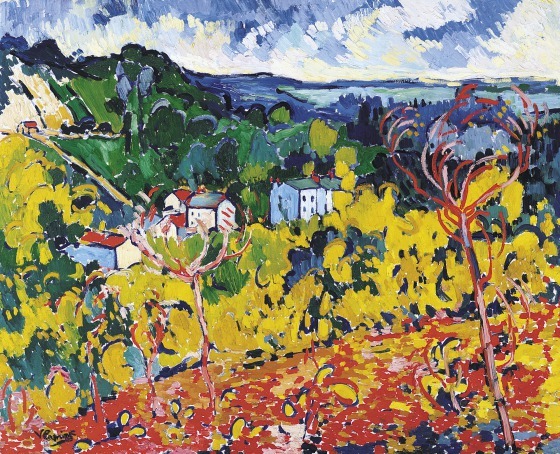 However, Maurice de Vlaminck’s use of a vibrant, saturated palette and emotive brushwork distinguish him from earlier landscape painting traditions. 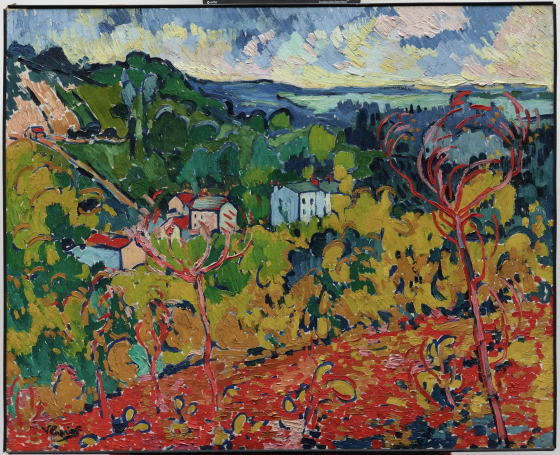 Created by Vlaminck between 1904 and 1907 during his brief Fauve period, Bougival embodies perfectly the qualities of the group. The striking red foreground, the strong yellow of the trees, and the pure blue of the background build a strong landscape in which movement and structure are balanced. 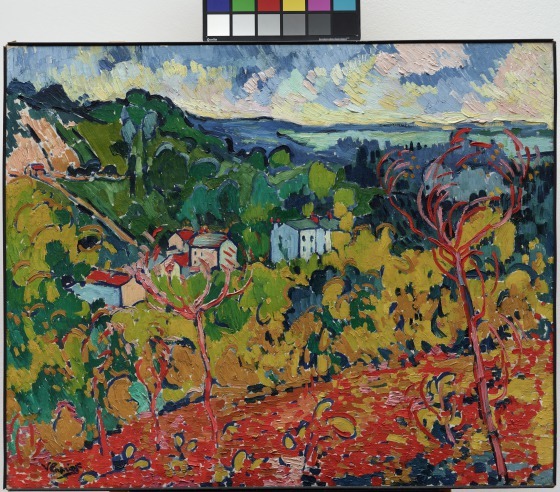 While the palette indicates his reverence for Vincent Van Gogh's emotional use of color, Vlaminck's tripartite composition reflects his awareness of Paul Cézanne's classically structured landscapes. Vlaminck fuses these two contradictory traditions in this vibrant view of the rural area west of Paris. The titular village had seduced many artists before Vlaminck, including impressionists such as Pierre-Auguste Renoir. Bonnie Pitman, ed., Dallas Museum of Art: A Guide to the Collection (New Haven, CT: Yale University Press, 2012), 232. Richard R. Brettell, Impressionist Paintings, Drawings, and Sculpture from the Wendy and Emery Reves Collection (Dallas, TX: Dallas Museum of Art, 1995): 137. 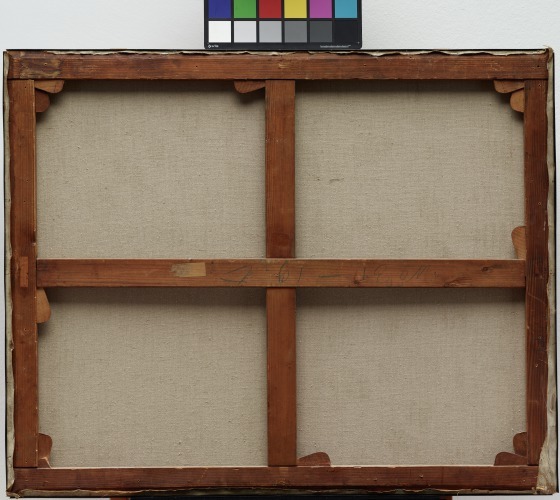 "Van Gogh's Sheaves of Wheat, October 22, 2006 to January 7, 2007," Teaching Resource, Dallas Museum of Art. 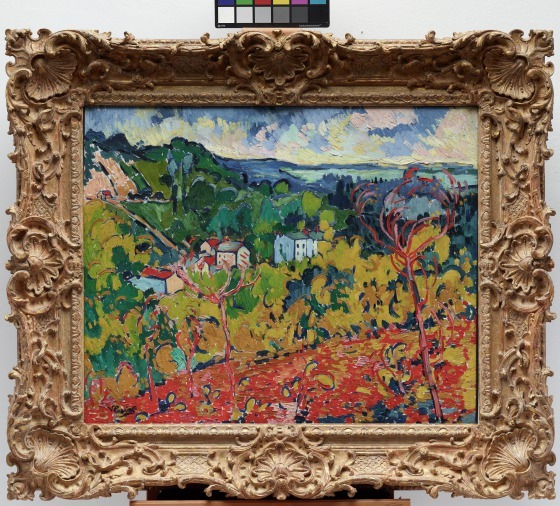 "Maurice de Vlaminck, Bougival," DMA Connect, Dallas Museum of Art, 2012. 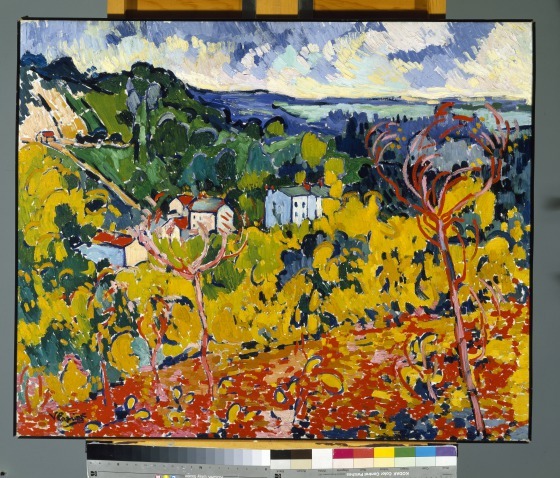 Learn about Maurice de Vlaminck (1876-1958). Regarding his painting, Vlaminck wrote, "I used to go to work right out in the sunshine; the sky was blue, the wheatfields seemed to be stirring and trembling in the torrid heat, with hues of yellow covering the whole scale of chromes; they quivered as if they were about to go up in flames. Vermillion alone could render the brilliant red of the roof tiles on the hillside across the river. The orange of the soil, the raw, harsh colors of walls and grass, the ultramarine and cobalt of the sky, harmonized to extravagance at a sensual, musical pitch. Only the colors on my canvas, orchestrated to the limit of their power and resonance, could render the color emotions of that landscape."